A Homemade Greek Yogurt Cheat Sheet gives a condensed version for how to make Greek yogurt. 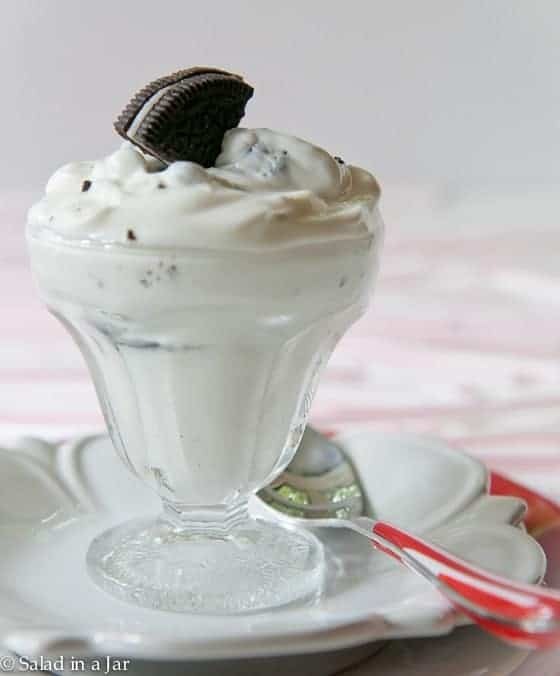 Directions for making a cookies and cream Greek yogurt treat are included. You can buy Cookies and Cream Yogurt in the grocery store but I wanted to make it myself with my own homemade yogurt. My first attempts weren’t so good. The tanginess of yogurt didn’t seem to dance well with the sweetness and crunchiness of Oreo Cookies. I finally figured it out; more on that in a minute. But first, I have a promise to keep. 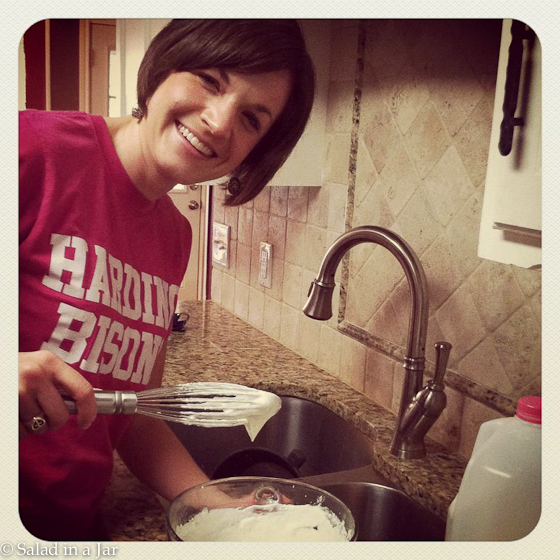 Susie, my daughter-in-law, recently learned how to make Greek yogurt from the instructions on this blog. She requested a Homemade Greek Yogurt Cheat sheet, and several of you agreed that you would like one, too. Susie shows off her first successful batch of Greek yogurt. Here is a quick summary. If you have any questions, need more pictures, or want to read the details, see the original post and be sure to watch my video below. 1. Fill a 2-quart heatproof glass bowl with milk. 3. Allow to cool down below 120 degrees F. 105-110 is ideal. 4. Whisk in 2-3 teaspoons fresh yogurt as a starter. Cover loosely. 5. Incubate at a steady 100 degrees F. for 4-8 hours. 6. When yogurt has thickened, pour into an extremely-fine mesh strainer to drain off whey. If you don’t have one, use a cheesecloth, a tea towel, or a old-but-clean t-shirt to line your strainer. Here is another inexpensive way to strain yogurt that I favor. Time needed will depend on the thickness of your yogurt and your straining method. Set aside or discard the whey. 7. Dump drained yogurt back into the original bowl and WHISK FURIOUSLY until yogurt is smooth and shiny. 8. Add flavorings and/or sweeteners, if desired. You may also whisk in additional milk if yogurt is too thick for your tastes. This method seems to work better than just crumbling a cookie into the yogurt. Maybe it’s the additional sugar and butter in the frosting, or maybe it’s because the crumbled cookies become slightly soft after marinating in all that butter and sugar. Either way, yogurt done this way is positively addicting. It fully satisfies the ice cream cravings that so often taunt me. Can I use this recipe using raw goat milk and store bought plain yogurt for a starter? Sharon, I have not tried goat milk myself so can’t say for sure. In general, raw milk makes a thinner yogurt but I’m sure that varies just like everything else involved with making yogurt. I was hating the incubating in the oven method. The babysitting to keep it around 100 degrees was giving me sleepless nights. Plus, any use of our stove drove the heat in the oven sky high so I had to have it out by 5:30 for hubby’s morning oatmeal. Thus, I broke down, coughed up $149 and bought a Brod & Taylor Proofing Box though Amazon. ( http://www.amazon.com/dp/B005FCZMU6/ref=sr_1_1?ie=UTF8&qid=1411838512&sr=8-1&keywords=bread+proofer ) It’s great. You set the temperature, out your incubating container of choice in and take it out for your desired level of tartness. We like very tart so I go with 12 hours, strain in chinois for 90 minutes gently using a spatula from time to time to move the more solid yogurt away from the sides towards the center so the more liquid can escape, then gently whisk (not furiously as I find that breaks it down) and refrigerate 4 hours. We love it. Makes great gifts put in pretty wide mouth mason jars. Thanks!! Wow Maria! Great solution if you have the space. Thanks for sharing your method. I would love to hear suggestions about finding a way to keep the temperature at 100 degrees for 4-8 hours. This is where my recipe fails every time. Sad to waste so much product. Have you seen this post? It has several ideas for you to consider. The comment section contains even more ideas. It’s been awhile since I made your yogurt, so I came back to check the starter amount- and boy you’ve been busy with the yogurt tips! I usually use the method of the heating pad in the cooler but I decided to try the warm oven overnight this time, since I didn’t get started until late in the day and I was doing a full gallon, more than my cooler will fit. After 12 hours it was jiggly but the whey hadn’t seperated yet. And the temp was only 82 degrees. ;( I’ve finally slowly reheated my oven to get the yogurt temp to 100 degrees and I’m hoping I didn’t botch this batch of yogurt with temps beneficial to other non-yogurt bugs. I use a wired probe constantly while doing this so I don’t have to mess with it much during the process. I’m hoping that my reading of other people on the internet using no temps and 24 hour incubation that I’m worrying for nothing. Keep up the good work! It’s been great reading all the new recipes and tips! Thanks for the tip on whisking the yogurt. I’ve been doing this for a while now, so smooth and creamy! I use a devoted-only-to-this-task plain, white flour sack towel for draining–they are about $2 for a 2-pack at Wal-Mart. Drape the towel in one layer over a large colander positioned over a bowl. Add yogurt. Gather the edges up and lay them over the top. I put the whole thing it in the fridge to drain. When I am done, the flour sack towel gets washed in plain, hot water (maybe a little vinegar or baking soda if I’m thinking about it) in the washing machine, by itself. Air dry, ready reuse for next batch. Discard the whey? It’s incredibly nutritious! And can be used to make the worlds best pancakes and biscuits! The whey has as many beneficial microbes as the strained yogurt. If you search for “How to use whey in recipes”, a ton of information will come up. Your pictures are great and your “cheat sheet” is very informative! And the Cookies and Cream yogurt looks very tasty! cool for 2 hrs, (I use to try to ck temp and gave up, finding 2 hrs worked for me) take out a cup and mix it with starter, whisk that in with 1 Tbs of vanilla and 1 cup of sweetner. wrap it in a towel and put it in a cold oven, light off, over night.. about 12-14 hrs. I started with less powdered milk but preferred to add another cup to soak up the remaining whey. I don’t find it chalky, it makes more (5 32 oz store bought yogurt containers) as I don’t have to deal with the whey. I put frozen raspberries or blueberries (I freeze them on plates then bag them) on the bottom of a serving and let them defrost before serving. Too good! Use an apple wedger, put wedges of 2 apples in pyrex with cinnamon, cover with plastic, microwave high for 4 min. when cool scrape the apple off the skin. Eat the skins while you mash the pulp, add apple/cinnamon juice from pan and apples to vanilla yogurt. Crazy good !! And my very favorite, lightly whisk baking cocoa into vanilla yogurt for chocolate yogurt. Some baking cocoas are better, give a richer chocolate flavor and require less. For a smoothie.. frozen strawberries, yogurt and a little milk (or none) and a plunger blender.. I make them in a large jelly jar glass, the plunger fits to the bottom just fine. Saw some of your postings and understand adding powdered milk, sugar and vanilla is a ‘taste’ thing. This is what tastes good to me. Paula, This is wonderful recipe. I have made yogurt before but never knew why it worked the way it did. I also was not sure what temperature to heat it up to and what temperature to cool it down too, kinda went it my gut and that never works when you try to teach someone else how to do it. Having the specific temperature ranges for heating and cooling is very helpful to me. What type of thermometer do you use to check…is it a candy thermometer? An excellent point you made is about the incubation of the yogurt and it requiring a low but steady temperature. I never owned an oven that has a “warm setting” or could be set to 100 degrees F. I use a heavy bottomed stainless steel dutch oven to heat up milk on a gas stovetop and always place the fresh (5-7 days) old starter from the fridge (measured out) on the glass gas stove top, so it gets to room temperature by the time the milk heats then cools down. That has always worked for me so I thought I can share that tip to others who are in the same scenario. To night I was revisiting the recipe and thought that I have to tell you that I have been making Greek yogurt from your site for almost 2 years , you made a believer out of me I have to make my own I still like the Okios one but the price is killing me. I make 2 batches a week with 4litres of 0% milk, for 2 people. Thank you so much for showing us so many good things . Btw I do salad in a jar too and we eat a lot more salad that way DH uses it in his lunch all the time , it’s there ready yum..yum…..!!. I make the raw milk yogurt all the time, it’s great and easy to make. Thanks for that tip on the frosting. I have used 1 tbsp. of fruit jams or jellies to add flavor to mine but now will try the frosting. Hi Paula: I was reading today’s blog when I noticed that you had posted a cheat sheet for making yogurt so I immediately came to this page. Thanks for helping those of us who are making yogurt for the first time. I was also glad to read your respose above to Doreen about the tartness. We happen to like a tart flavor and now you’ve resolved that issue for us. The lid attachment for my FoodSaver should be here tomorrow and do I ever have plans for it. I’m so glad I found your wonderful blog! Many thanks. So glad you wrote. I can’t wait to hear how the vacuum-packing go for you. I have been making Greek yogurt every few days ever since I found your site a few months ago. It’s been wonderful! Thank you! Thank you! You! Increased my calcium intake and I’ve lost a few pounds along the way because this nicely fills me up with few calories. My 7 1/2 year old even loves it with just with a little honey. Last night I left it in the oven and forgot to strain. It’s now been in there for almost 24 hours. Is there a point where the active live cultures are no longer “active and live”? I have done the same thing–more than once. If it smells fine, I refrigerate and eat it. The longer yogurt incubates, the more tart it becomes. I’m sure the little microbes run out of sugar to eat at some point (making it more tart) but I’m not sure when that is. If you don’t care for tart, I suggest you let it drain for a LONG time and then add milk back to get the consistency you like. Thanks for the great hints for making Greek yogurt! I love it. My 2 year old grandson comes to my house and asks if he could have some of my yogurt. He loves it plain! I’ll have to try this recipe it would be great for fruit and yogurt parfaits and smoothies. Thanks for sharing! With this cheat sheet I just may be able to make some and discover why! Thanks for the mouthwatering post. Im enjoying the best yogurt in the world thanks to you. I was pretty scared. Everyone loves it! It is super creamy it has no tartness at all! Seems everyone is raving about Greek Yogurt. With this cheat sheet I just may be able to make some and discover why! Thanks for your fantastic blog! Im enjoying the best yogurt in the world thanks to you. I was pretty scared. I purchased the boullion strainer and a really good thermometer ( both were pretty pricey) I almost backed out. Good thing I didn’t! Everyone loves it! It is super creamy it has no tartness at all! Today salads in a jar. To any one out there thinking about making Greek yogurt this website has the best easiest directions and they work! Found your site a while back and have made the yogurt a few times. Love it. I like to simmer it with a vanilla bean and add some sweetener to make french vanilla flavor. 🙂 I also just got in my jar sealer attachment and am ready to try some salad in a jar! Small world! French vanilla yogurt sounds wonderful. Wish I had some right now. Good luck with your salad. I learnt to make yoghurt from your website about six months ago and now have it down pat. I have a couple of tips that may help others. I use a wide mouth thermos flask as the incubator. Works great. Also I use cheese cloth doubled up and placed over a metal strainer. Found it was a bit messy at first but if you place it in the fridge overnight the yoghurt thickens a lot more and then you just tease the yoghurt from the sides of the cheese cloth by just lifting it and shaking it. After the edge of the yoghurt on the cheesecloth comes away (you may have to scrape a little) you will find the bulk of the yoghurt in the middle of the cheescloth will just slide into another bowl with very little left on the cheesecloth. You then just soak cheese cloth in hot water and rinse. I keep a little of the whey in case I need to add it back to the yoghurt to get the required consistency. Also adding frozen blueberries or raspberries after you defrost them makes a tasty and healthy flavouring. BTW the longer you leave the yoghurt in the thermos the thicker it becomes. Laurie, thanks for taking the time to share. You never know how your method might give someone else an idea. Paula, I have had great luck lining my over the sink wide strainer with 2-3 layers of Bounty paper towel and then pouring in the yogurt to strain. Easy cleanup, and the yogurt easily drains through the paper towel. Thanks for this comment. I went and bought cheesecloth, but it is not cheap and I have learned that it is complicated to wash and reuse.. I have tonnes of paper towel though… 🙂 Tonite is my first night making the yogurt… How much does 2 quarts make? I don’t like cheesecloth either. Or paper towels. That’s why I buy a very fine mesh strainer (large so you don’t have to strain in batches) and then you don’t need either. How much Greek yogurt you get from 2 quarts of milk depends on the type of milk you use and how long you strain it. It will likely reduce by at least half, maybe more. Paula, John and I have been planning to make your recipe for Greek Yogurt. He even read through your directions. We have been super busy with yard work (achy right now as we spent hours working today) but making your yogurt is high up on our to-do list. Appreciate this post too!